Walrus are semi aquatic mammals who live both in water and on land. They are black, with weigh over a thousand pounds and have very thick skin. They have extremely long canine teeth which are called tusks. Walruses can be found both the Pacific Ocean and the Atlantic Ocean, in those areas where it is very, very cold. 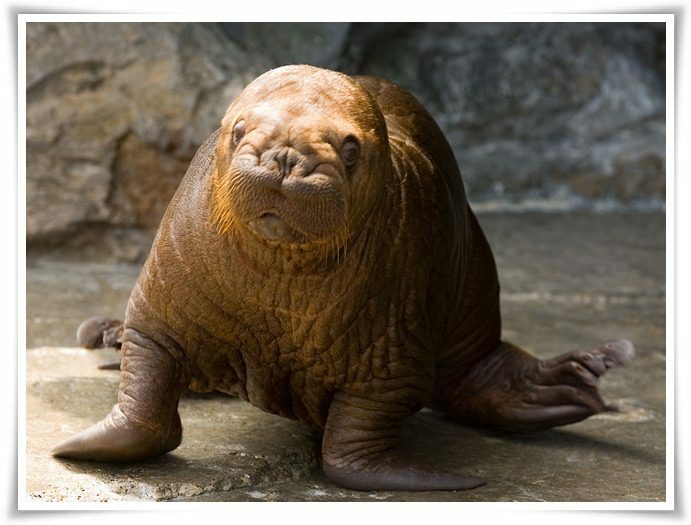 Walruses eat fish, clams, shrimp, crabs, tubeworms, soft coral, turnicates, sea cucumbers and mollusks. Walruses live several days at a time in the water and several days at a time on land or floating ice packs. They live in large herds. ⧪ Savoonga, Alaska is known as the Walrus Capital of the World. ⧪ Walruses use their long tusks to dig into ice packs and help them to pull themselves out of the water. ⧪ Walruses use their pectoral flippers to help them walk on land.